Thorsten Heins and Co. are having an awesome Wednesday, which happens to be one week after the BlackBerry president/CEO and some of his cohorts introduced the world to the completed BlackBerry 10 OS and Z10 and Q10 handsets. According to Heins, the touch-only Z10, launched last week in the U.K. and yesterday in Canada, is off to a better start than phones past. "In Canada, yesterday was the best day ever for the first day of a launch of a new BlackBerry smartphone," Heins said in a statement released today. "In fact, it was more than 50 percent better than any other launch day in our history in Canada. "In the U.K., we have seen close to three times our best performance ever for the first week of sales for a BlackBerry smartphone." Actual sales numbers are hard to come by, but the sentiment from Heins is encouraging for the phone, the OS and the company's future fortunes. The Canadian figure is crucial not only for the launch numbers sold but as an emotional win for the company. BlackBerry, formerly known as Research in Motion, is based in Waterloo, Canada, so for the Z10 to get such a good reception in its homeland has to be a spirit booster. 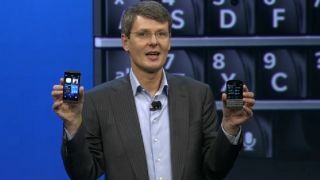 RIM-now-BlackBerry's struggles are well documented, especially in the U.S. where use of its phones has shriveled to nearly nothing. Neither the Z10 nor Q10 are on sale south of the Canadian border yet, so how the phones are received here will be critical to whether we're even talking about BlackBerry a few years from now. U.S. carriers Verizon, T-Mobile and AT&T are confirmed to start carrying the Z10, while Sprint has made no announcement regarding whether it will carry the phone. Though there's no exact release date, March looks like the month when U.S. customers can start buying up the all-touch BB10 handset. Will it be just as rousing as the U.K. and Canadian starts? Time will tell.